With our van still not ready and, having moved our holidays several times because of the constant delays, we decided we needed a break. We've had no time off for 9 months so were very much ready for a change of scenery. We wanted to go somewhere quiet and peaceful, by the sea but close enough to home to return if our van were to be finished and ready to collect (fat chance!). 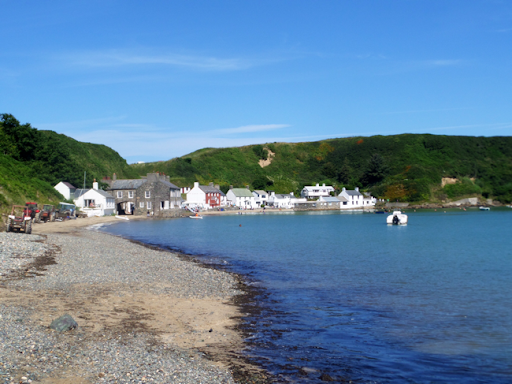 So we decided on the Llyn Peninsula in North West Wales. 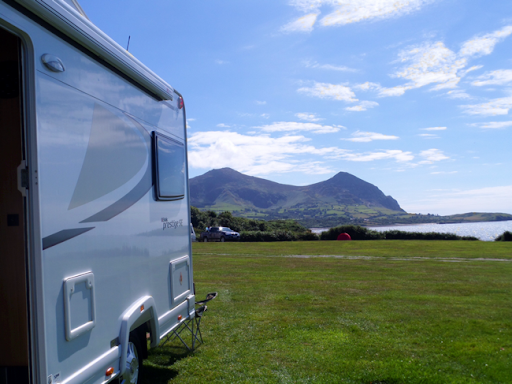 We decided to stay on the same site for the first two nights to enjoy a bit of relaxation without the need to drive, so I booked us in to the Aberafon Camping Site, in Gyrn Goch, nestled between Gyrn Goch mountain and the beach. 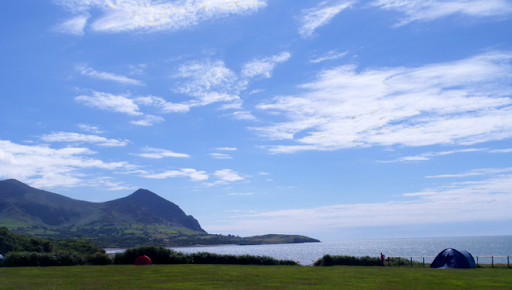 I found this site in a great little book from Vicarious Books titled 'Sea View Camping Wales'. This site had several different fields and our pitch overlooked the sea, beach and mountains. We'd packed the van the night before, so after breakfast we packed our food and drove down to the unit, filling up with fresh water before heading off. On the way down we stopped at the Welsh Food Centre at Bodnant for sour-dough bread and wine. We arrived at the site in the early afternoon and, after setting up, went for a walk along the pebbly beach, walking down to the jetty and small harbour at the end. Returning, it was time for a G&T and a sit in the sunshine. I lit the BBQ and cooked us lamb chops and chorizo sausage, with salad and wine. A bit tired and confused (those G&Ts were a bit strong!) Cathy had an early night while I sat and watched the sunset. The weather was wet and windy today, with the tops of the mountains hidden in low cloud, so we spent most of the day inside the van reading and snoozing. We did manage a short walk later in the afternoon, but the rain soon drove us in. Dinner tonight was cooked in 'Oska' - the rest of the chorizo skinned and chopped up, with tinned tomatoes, garlic, peppers and some croutons made with the last of the sour-dough bread. We woke to lovely blue skies - time to move on. 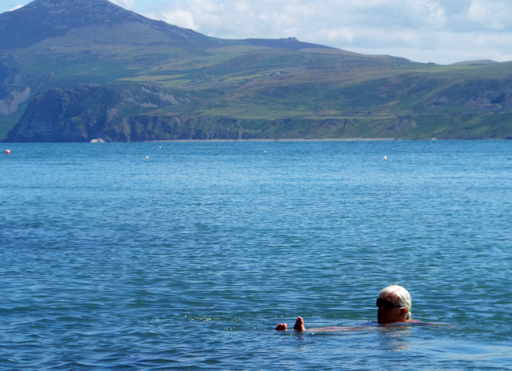 I looked through our 'Secret Beaches Wales' book and we decided on Porth Dinllaen. Packed up and fluids emptied and topped up, we drove the few miles to our next stop - the beauty of this area is that nowhere is very far away. 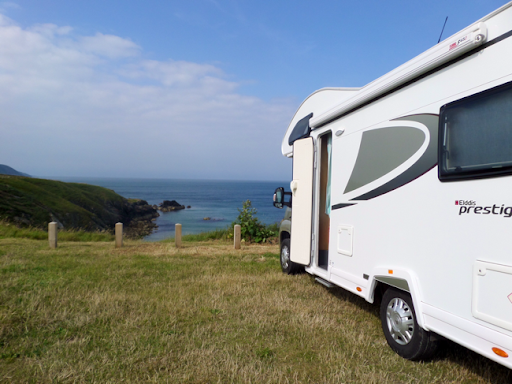 The roads are mainly quiet country lanes, which can be challenging in a large motorhome, but there are plenty of passing places and nobody seems to be in a hurry. We arrived at the car park to find it's owned and run by the National Trust, so free to us members (thanks to Nicola & Chris). There was plenty of room so we parked by the cliff, packed our swimming stuff and walked down the 60 steps to the beach. The tide was in but there was still room to walk along this sandy beach. We headed towards the small waterside hamlet of Porth Dinllaen in the distance. 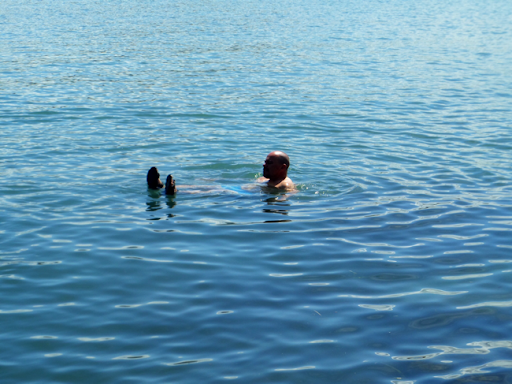 With blue sky, hot sun and calm, clear waters, we could easily have been in the Med. We reached the cluster of holiday cottages, fishermen's sheds and the Ty Coch Inn and walked beyond that, along the coastal path, towards the lifeboat station. It was a rocky headland but there were plenty of places to get to the water - great swimming spots! We picked ours and Cathy was first into the sea - the delight on her face to finally be swimming in the sea again was great to see. I was next - initially chilly I was soon fine and enjoying the feeling of salt water on my skin again. After about 15 minutes we headed back to the rocky shore to dry off before walking back to the Ty Coch Inn for lunch. This is a great little pub and we managed to bag a table overlooking the beach. I ordered us a beer and grabbed a menu. It was mainly sandwiches, paninis and jacket potatoes, but looking around the portions were generous. Cathy had a welsh black beef sandwich and I had chicken, ham and mayo. It was lovely sat barefoot, eating our lunch and watching families play on the beach. We headed back along the beach and stopped off for a sunbathe. I went back to the van to get our chairs and some fruit while Cathy went for another swim. Back at the van, I booked us in to a CL (max 5 pitches) at Llangwnadi. We enjoyed the rest of the afternoon relaxing on the beach before heading off to the CL. On arrival we were met by two oldsters who insisted we pitch over in the far corner, but as there was no electric hook up, I ignored them and pitched in a spot between the other vans and next to the EHU. They were a very funny couple, having been to this CL for the past 25 years (so perhaps they thought they owned it!?). 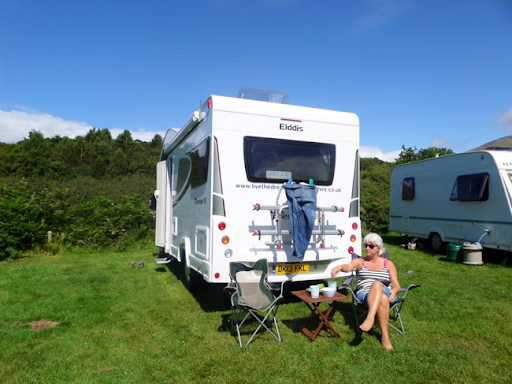 We walked down to the owner's main campsite and house to pay for the pitch and explained about the old couple - the owner said we were fine where we are (phew!). Back at the CL the old chap was touching up the paintwork on a caravan and explained someone else tows it there while they followed in the campervan - so basically they were taking up two pitches - no wonder they were keen to push us into the corner. Still, I made the peace by showing him our Secret Beaches book and wrote the details on some paper for him. Dinner tonight was BBQ again (if the oldsters allowed us to light it!). I made a marinade of marmalade, peanut butter, garlic, salt, pepper, chilli flakes and olive oil for the pork steaks, which we had with couscous and salad and wine. Then it was chilling and reading time before bed (by this time we had no phone signal so no chance of interruption). We woke early and walked down the lane to a large and empty beach. The tide was out and we had the place to ourselves. Back at the van, breakfasted and showered, we emptied/filled fluids and headed off, no doubt to the relief of the oldsters still inside their caravan! 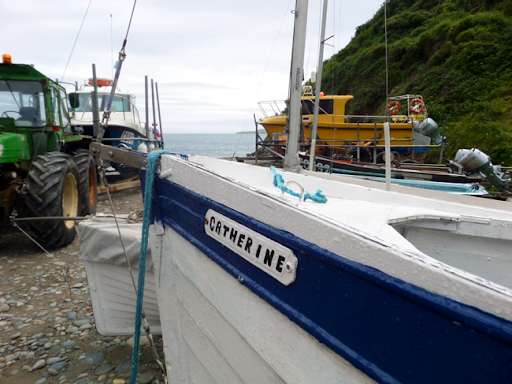 Our next stop was to a small cove used by fishermen, which I saw in the NT handbook - Porth Meudwy. The car park was free and empty as by now it was raining quite heavily. We stopped in the van for some lunch and waited for the weather to improve. It wasn't long before the sun was out so we walked down the track used by the fishermen to the small cove. 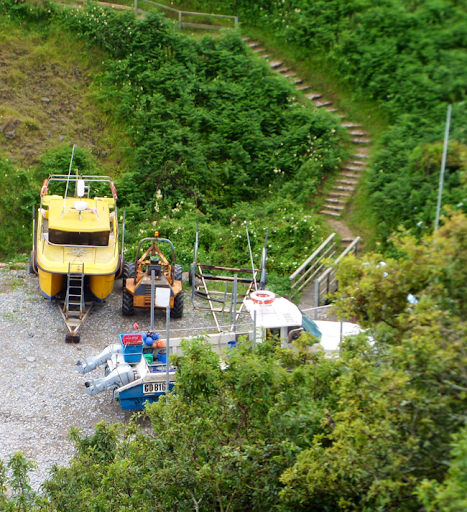 There were about 4 fishing boats and one had just been brought in at the top of the tide. 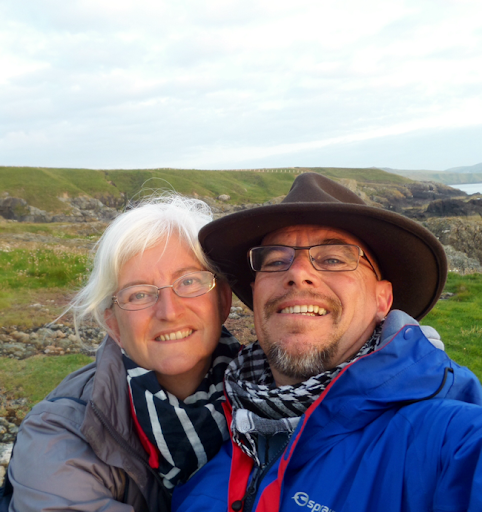 We the followed the coastal path up and over the cliffs, with great views and made our way down to Aberdaron to walk along the beach. Although quite windy it was warm and sunny, so we enjoyed the sound of the surf as the tide receded. Reversing our route, we had a quick brew at the van before deciding where to stay tonight. 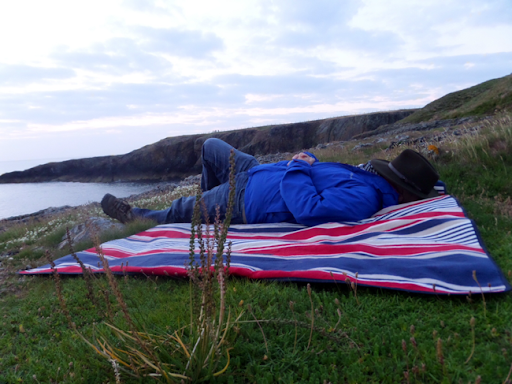 I picked a campsite called Mynydd Mawr at the very end of the Peninsular, overlooking Bardsey Island. This was a small site comprising two fields, one slightly sloping and one flat. Nobody was around so we picked a pitch and hooked up. I planned to pay at the onsite cafe in the morning but, as I was preparing dinner, the owner turned up for a chat and payment. The sky was blue and sun strong, but it was quite windy. 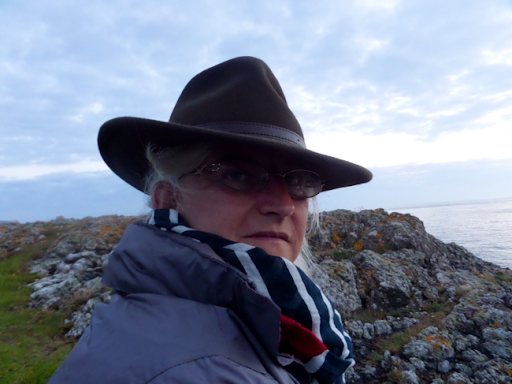 After eating and washing up we took a walk along the headland, then climbed the westerly headland to look at the setting sun and towards Ireland. The owner said on a clear day you can see Wicklow, but with the sea haze and low sun, we didn't spot it. Back at the van we sat in the cab seats with a beer to chill and watch the sun drop before heading off to bed. We also watched four old amigos playing ball. They were staying in a small caravan and tent and had clearly been on the lash for most of the day. We tried to guess who they were - ex-hippies, blue-chip CEOs escaping the cut and thrust of business life, or maybe just four old mates escaping from their wives for a few days! We both slept well and the morning was sunny and already hot at 0800. We sat outside with a brew hoping that the café was going to open so we could get a cooked breakfast. Sadly it didn't (weekends only?) so instead I made us a bacon and egg sandwich, before wandering over to the washing up shack. We topped up fresh water at the pitch then drove down to empty the loo and grey water, before heading off. 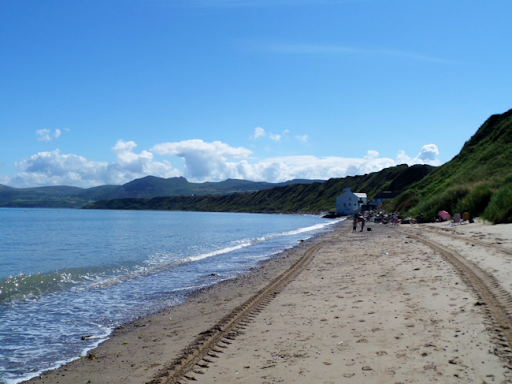 Our plan was to park at the National Trust car park again and walk to some coves called Borth Wen. 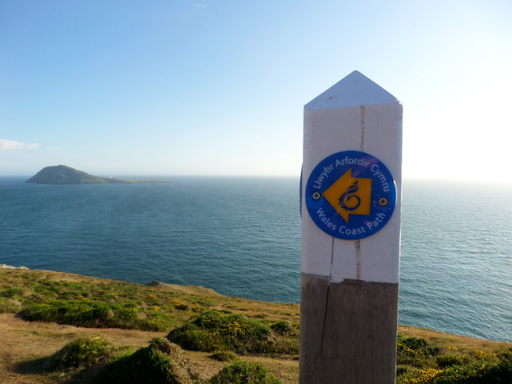 This meant crossing a golf course using the public footpath, but the golf club had decided to remove the path markers which made it very difficult to find, so we ended up following the coastal path right around the headland to end up at Porth Dinllaen again. 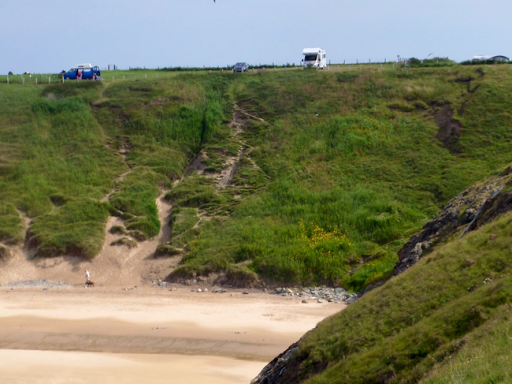 We walked along the path, past where we swam on Tuesday, to the small sandy beach next to the Lifeboat Station. This was a lovely quiet spot with calm waters and we both enjoyed a swim. At least it was peaceful until a group of about 100 school children descended on the beach, surrounding us with noise, chattering Welsh and much digging of holes! 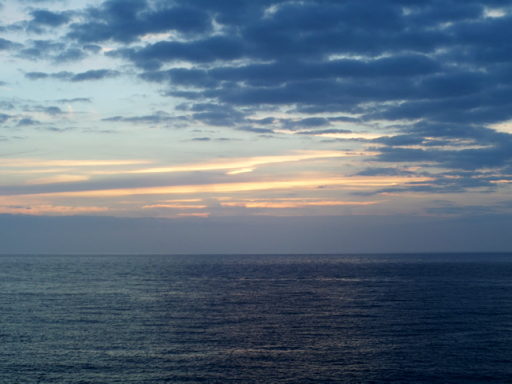 They took turns to visit the lifeboat station and within an hour peace returned. 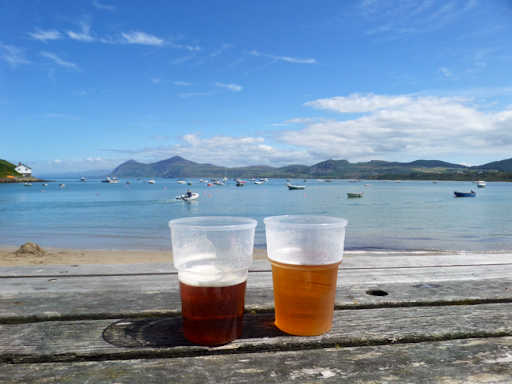 Sun tanned and dried, we walked back to Ty Coch Inn for a beer before making our way back to the car park via the beach. I had phoned the van converter in the morning to get an update - he was supposed to call me yesterday but of course didn't - this is usual. He said the van might be ready tomorrow and he'd call me later to confirm - again as usual he failed to do this. So on our return I rang him again, only to be told the cushions & curtains aren't ready, blaming the lady doing this for the delay (no mention of the 6 months he's delayed things so far!). When I told him we would not take delivery (or pay him) until everything was completed, he pretty much said in that case he would sell the van and refund our money. A job that should have taken just 6 weeks has now taken longer than 6 months and still no end in sight. Now we just want to get the van from him and, needless, to say, we will never recommend anyone to use him. By now we were ready for something to eat so drove to find fish and chips in Abersoch. We spent quite a lot of time (and several circuits of the one-way system) trying to find some motorhome friendly parking and eventually parked in an official but unattended car park (no trailers or motorhomes allowed). Having found the chippy, we took our supper and sat on a warm, sandy beach to eat them, eyed up by a couple of shifty looking shite hawks (aka seagulls!). On our way back to the van we bought a few groceries. 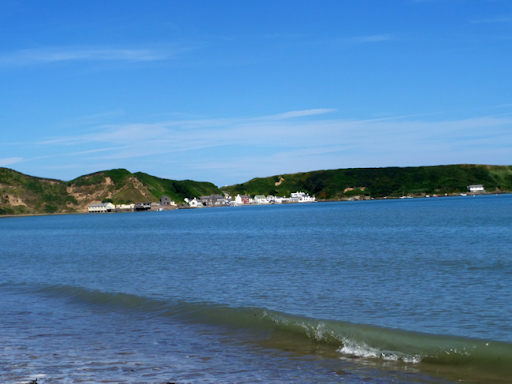 I don't think we'll be visiting Abersoch again - pretentious, tacky and over-priced. We'll stick to the quiet areas. 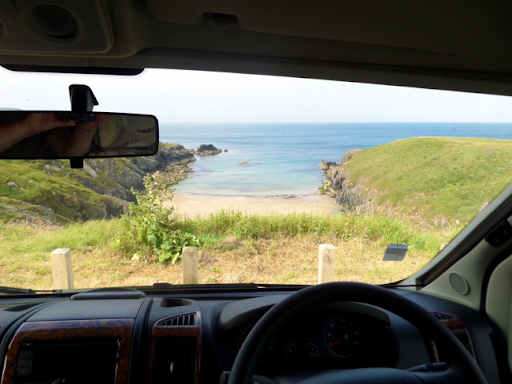 Back at the van we decided to try wild camping tonight at the car park by Porth Meudwy we found yesterday. But as tomorrow's the weekend, I thought I'd better book us in to a site for Friday & Saturday as they seem to fill up quite quickly. 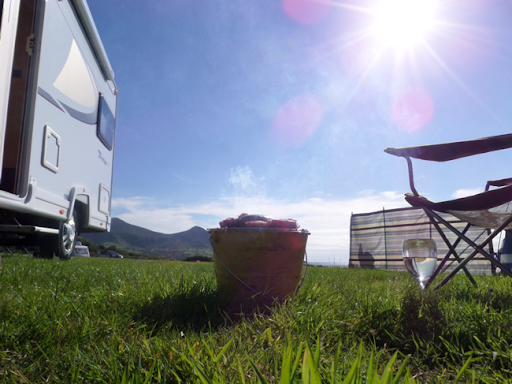 I rang a couple of sites - no answer - how the frig can you run a campsite and then never answer the phone! I eventually got through to a site on a farm about 1/2 mile from Aberdaron and booked us in for two nights - at least I think I did - couldn't understand a word the lady said! We headed off to our wild camping spot and arrived at about 1900. There were a few cars here so we tried to look like we had just arrived for a quick brew and a walk - until Cathy got the chairs and table out! I had a lovely shower to get rid of the salt and sand, as did Cathy (after me that is - there's no room to share a shower in a motorhome!) and we sat outside with a brew and reading. There's only one car left here now and then perhaps we'll have the place to ourselves. Let's see if we survive our first night wild camping in the UK! Well, we survived out first night wild camping in the UK. Once the final car left we had the place to ourselves, the only sounds were chicks shouting to be fed nearby, plus a field of cows having a good moan. We sat in the cab seats reading until about 2200, then read in bed for a while. Sometime in the night a thunderstorm came in, with lots of thunder, lightning and very heavy rain. We woke to cloudy skies but it was still very muggy. 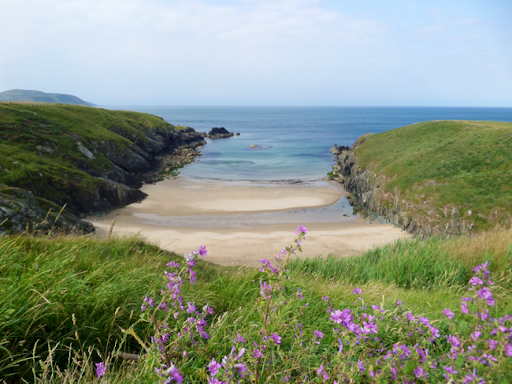 Breakfast was a bacon and egg butty, then we drove off to our next stop from the Secret Beaches book - Porth Iago. We drove down a narrow farm track and paid the £3 to park all day at the ticket machine outside the farmhouse. We weren't really prepared for what we found. 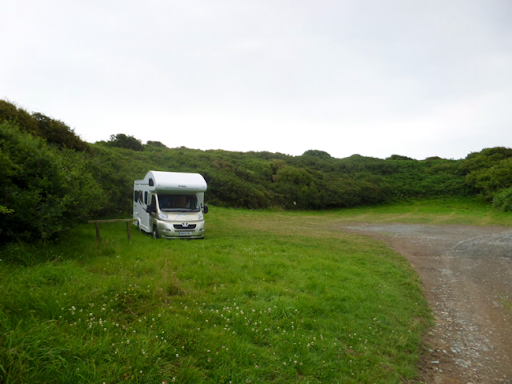 We drove past a small campsite and into a grass car par, on the cliff edge overlooking Porth Iago. 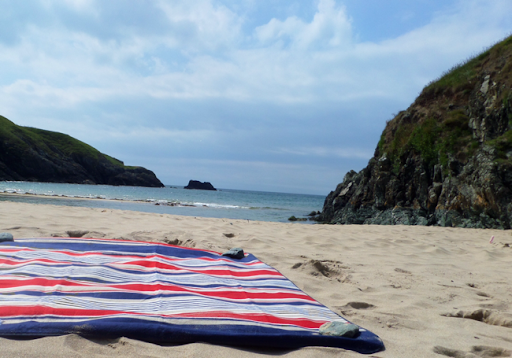 The view was stunning - clear out to sea and the beautiful, white sand of the cove with the tide out. 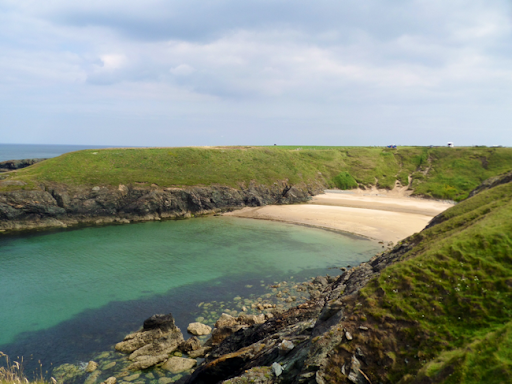 We walked down and had a wander around - it's only a small cove but we had it all to ourselves. On the way down I saw a sign for overnight parking for £8, so we decided there and then to stay here overnight. 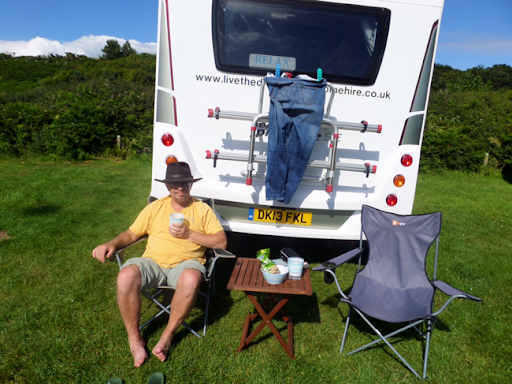 This is the sort of camping we had in mind when we thought of getting our own van - sat in warm sunshine with a fantastic view and a small beach with great swimming. We had a walk south along the coastal path towards Whistling Sands - it was away in the distance so we turned back towards the car park (my left ankle's been playing up so I can't walk far at the moment). Back at the van I drove on to the levelling ramps and set the heating and fridge to gas while Cathy got the kettle on. 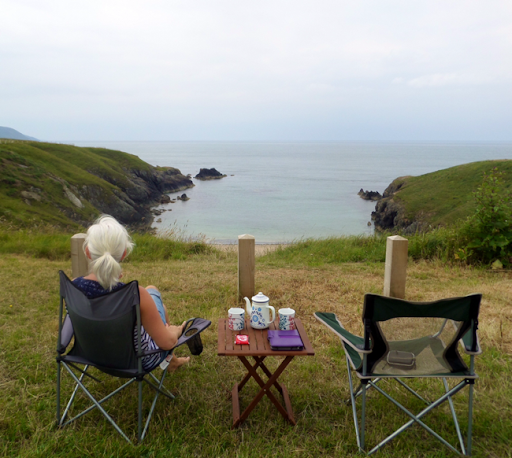 We sat outside with our brew in a really warm breeze, watching the tide come in to the cove. Shortly after we had a lunch of chorizo, garlic salami, hummus, red pepper & goat's cheese tapenade and krackawheat. Then it was time to hit the beach. The tide was on its way in, but the soft white sand was above the high tide mark, so we set ourselves up and went for a swim. It was chillier but still refreshing and after a good swim we walked up and down the beach, shuffling our feet to make the sand squeak - we don't need Sky TV to be happy! We spent the afternoon sunbathing, snoozing, swimming and chatting about all sorts of subjects from quantum physics to Spanish tapas! 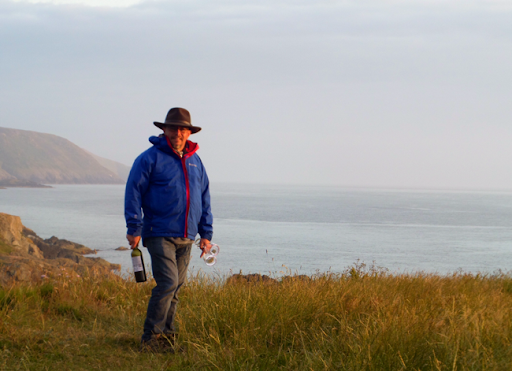 About 1700 we walked up the cliff path to the van for showers and sat outside overlooking the cove with a beer. 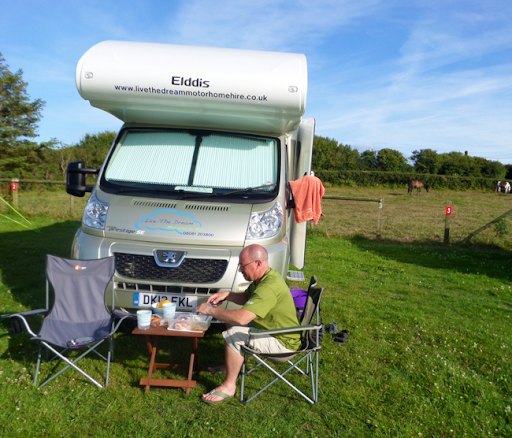 It was blowing a hooley so eventually we moved into the van, where I cooked grilled welsh lamb steaks, patatas bravas with a spicy red pepper sauce & mayonnaise and a salad. 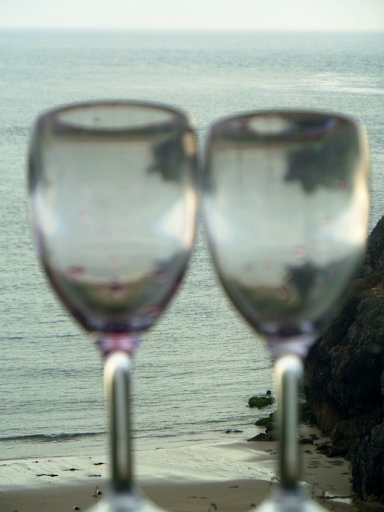 We had a couple of glasses of red wine then saved the rest for later. Washed up and cleared away, we dressed warmly and walked to the end of the headland with a picnic blanket and the rest of the wine to watch the sunset. By now the wind had dropped and we sat on the grass watching the sun set and chatting. 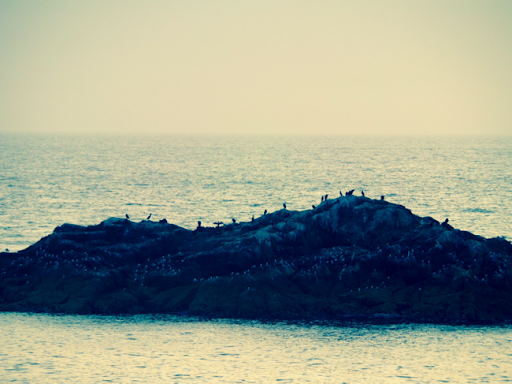 We saw various sea birds heading off to roost, plus either a dolphin or porpoise surfacing. 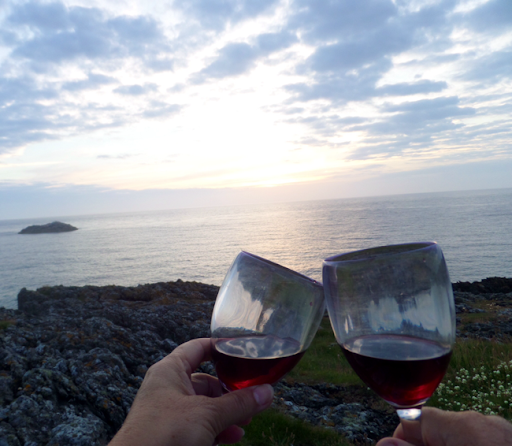 As the sunset we finished our wine then sat until almost dark, before walking back to the van. Now safely and warmly tucked up, it's so quiet my ears are ringing from the silence. 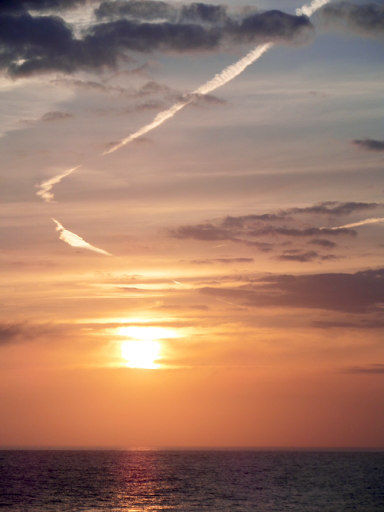 After a lovely, relaxing day with sun, sea and good food, I'm sure we'll sleep well tonight. Handbrake on and in first gear - just in case! We both slept really well in the peace and quiet of Porth Iago and awoke to a grey but warm morning. 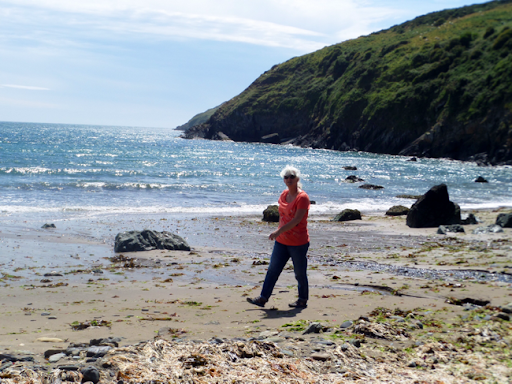 After a cuppa in bed we dressed and walked the other way along the coastal path towards the other cove mentioned. 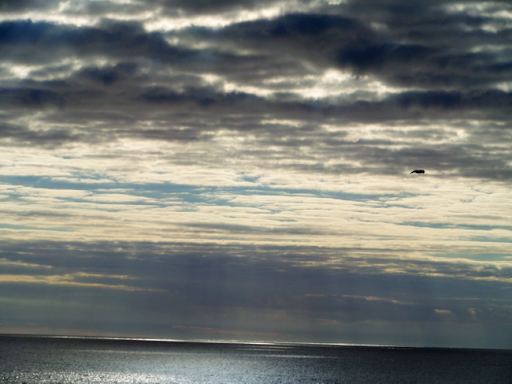 The sea was like a mill pond and a couple of fishing boats were out checking their lobster pots. We walked along the narrow path, trying but failing to avoid the sheep poo! The other cove was narrower than Iago and pebbly - nowhere near as nice - so we didn't bother to go down but instead turned around, ready for our breakfast. As we sat outside a couple came with two large kayaks and lowered them down the steep dune cliff on a rope - clearly they'd done this before. We washed up, secured, waved to the family in the little van that had spent a couple of nights on the cliff top and headed off. On the way out we stopped at the farmhouse to pay the £8 overnight fee. The farmer was a typical strange sort - didn't say anything, didn't make eye contact, just went into the house and came back with the change for my £10, handed it over without speaking and walked back the the shed. Another guy (his twin brother?) turned up in a land rover and stared at us until we drove off - strange pair. We drove to the NT car park as it's the only place we've had a phone signal. There was a voicemail to call Paul the van converter, so I sent him a text. Finally, our van is ready (apart from cushions, seat covers & curtains - we'll get them later) so I arranged to pick it up on Friday morning, which should give us time to get it ready to head down south for the annual camp out with Jane, Ron & gang. 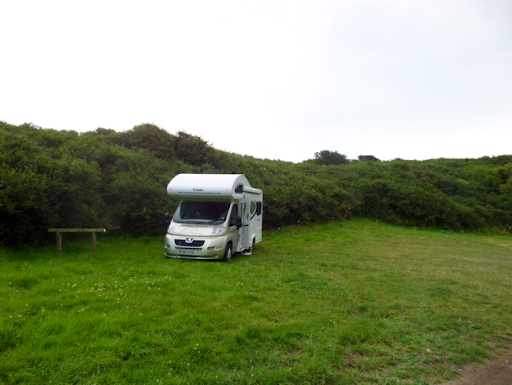 By now it was tipping down with rain, so I picked a campsite out of the Seaviews book - Dwyros Camping & Caravan site. I dialled the coordinates into the satnav and drove off. On arrival the owner showed me a pitch - not ideal as it was in the middle of the field, but with hook up and water, for one night it'll do. Cathy hooked us up and filled fresh water while I emptied the loo. This is quite a large site and we seem to have landed amongst the crocs & onesies brigade - lot's of noise, kids on bikes (and adults in cars) driving over the hookup cable - we won't be back here! But settled in, Cathy did some packing while I downloaded last night's photos. We had some lunch and chilled out - it was quiet now and hopefully the cloud and mist will lift later so we can take a walk into Aberdaron, which is about half a mile away. 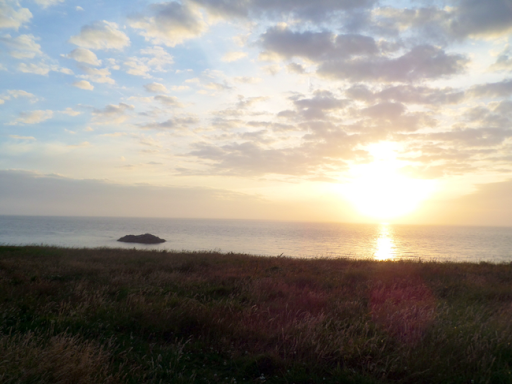 Finally the weather improved and we walked down the coastal path, then up again and we ended up opposite the campsite! We walked down into the village to find a spar shop, bakery, fish & chip shop, cafés and pubs, plus another free NT car park! We had a couple of drinks in the pub overlooking the beach and ended up chatting to the Mr T on holiday. Back at the van I cooked pasta carbonara with a bottle of white wine. Now the rain has stopped and the views have improved, so we're sat reading. But we won't be sad to leave this campsite. We didn't sleep well. The Chavvy TCP neighbours were talking loudly and playing music until 0230, then we were awake and up by 0630 for breakfast, dump waste, pack and leave - we were glad to get away and will avoid large campsites in the future. Our drive back was fine and after 2-3 hours cleaning the van, we locked it away and returned home to unpack and sort out. 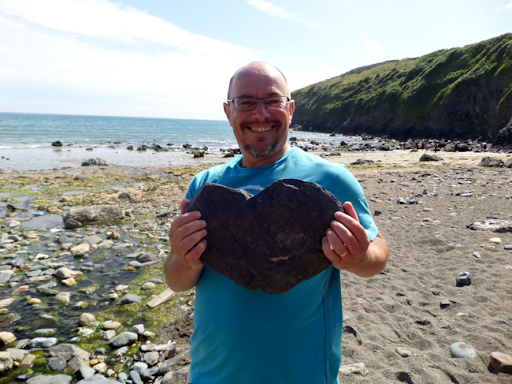 We really enjoyed the Llyn Peninsular and will definitely go back. It's like a little slice of Cornwall on our doorstep, only we can't understand what the locals are saying! 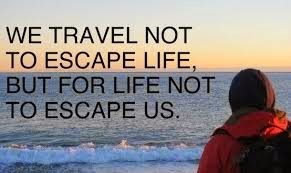 Hopefully next weekend we pick up our own van and head down to the south coast to meet up with our great friends, Jane & Ron, plus others for our annual camp out. Tour de France en Yorkshire!